Early indications show that broadband investment continued to increase in 2018, building on the momentum shift we saw in 2017 when the FCC initially signaled its intention to restore a forward-looking regulatory framework for broadband. Since 2011, USTelecom – The Broadband Association has reported aggregate industry capital spending figures after collecting, analyzing, and evaluating all relevant data and ensuring consistent comparisons over time. According to an initial review of financial releases by USTelecom, capital spending for the six largest broadband providers increased in 2018 by approximately $2.3 billion (3.6 percent). Many providers have yet to report full year 2018 capex figures, and USTelecom has not completed a full analysis with all necessary adjustments. 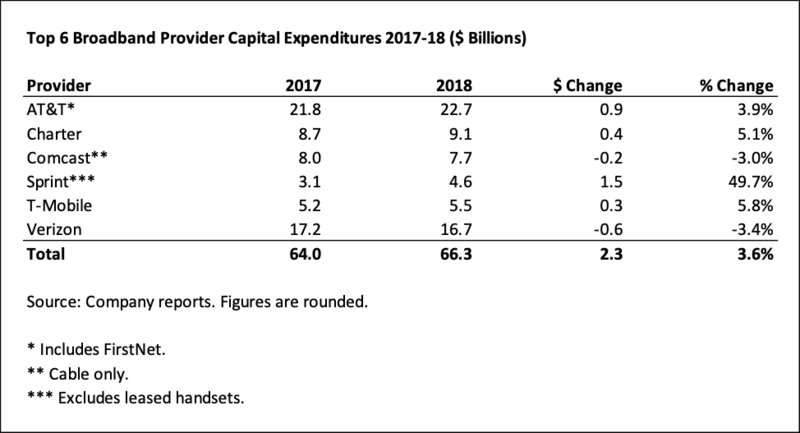 Still, publicly available data from AT&T, Charter, Comcast, Sprint, T-Mobile and Verizon show capex spending in 2018 increased $2.3 billion. These companies typically account for approximately 80 to 85 percent of annual broadband provider capital spending. As detailed in previous USTelecom research, annual investment in broadband infrastructure declined by about $3 billion from its recent peak of $78 billion in 2014 to approximately $75 billion in 2016. In significant part due to the anticipation of the FCC’s action in 2017, annual broadband investment rebounded. Capital expenditures by all broadband providers increased approximately $1.5 billion to more than $76 billion in 2017. While this is encouraging news, the important question for policymakers is not what happens to broadband investment from one period to the next, but what long term investment would look like under a different regulatory regime, holding other relevant factors constant (e.g., macroeconomic conditions, technological developments, capital costs, taxes, and competitive upgrade cycles). Still, the decline in capital investment starting in 2015 and the recovery in capital expenditures that began in 2017 suggest the likelihood of a negative regulatory impact from the 2015 utility classification of broadband providers and, conversely, a positive impact from a return to a more pro-consumer, pro-investment, and pro-innovation policy environment in 2017. Pack the Apps for College!